If tickets are sold out, you can come to the theater 30 minutes before showtime ​to put your name on the standby list. ​Hang out next door at The Taproom while you wait! On the second Saturday of every month, join longtime local favorites The Ha-Ha's along with a new special guest every time! This month, we're excited to play with Kornfeld & Andrews from The Magnet Theater (NYC)! This show features The Ha-Ha's performing "Armando." True stories from a special guest monologist will launch the team into a series of inspired, connected, and completely improvised scenes. Monologist TBA! ...and our friends: The Magnet Theater's Kornfeld & Andrews! 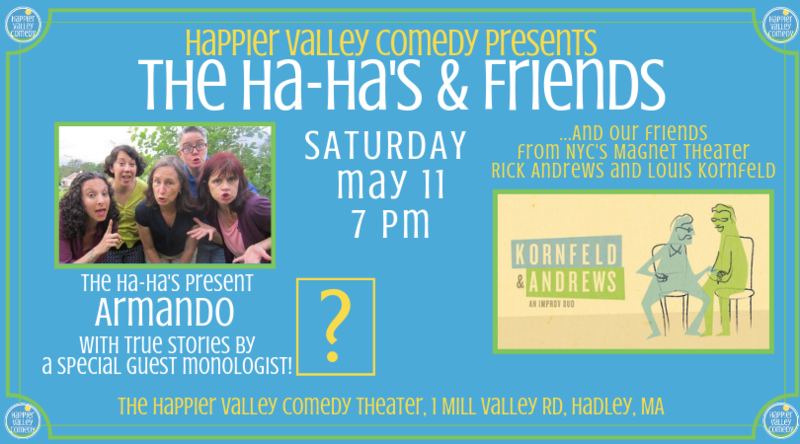 Seasoned performers, longtime instructors, and all-around swell guys Rick Andrews and Louis Kornfeld combine their improv powers for a longform show that's as honest as it is hilarious. With a patient, nuanced style, they create a textured world filled with characters that will make you laugh and move you all at the same time. It's comedy. It's theater. It's a performance you won't soon forget. ​Our shiny new theater only seats 60 people, so buy your ticket online to guarantee your spot. **In case the parking lot fills up, we can use the lot right next door at 50/50 Fitness/Nutrition! Your ticket includes admission to the 9pm show "More Improv, More BetteR!" If tickets are sold out, you can come to the theater 30 minutes before showtime and put your name on the standby list. LET'S MAKE THE HAPPY VALLEY HAPPIER! Voted #1 in Family Entertainment!